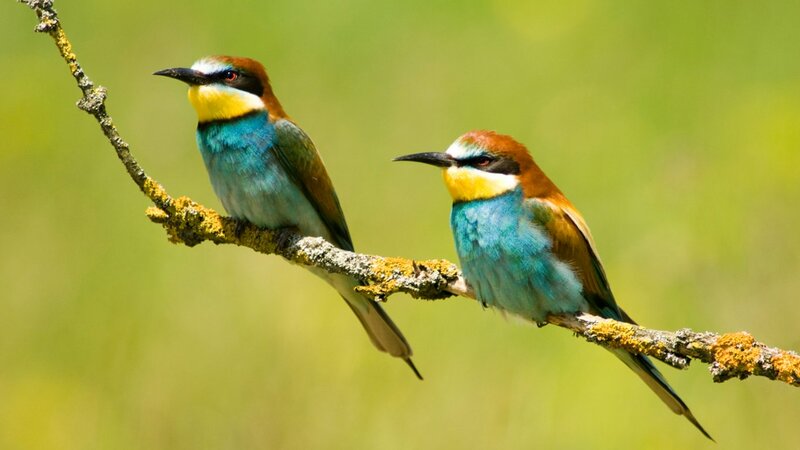 [post_ads]As the name suggests, bee-eaters predominantly eat flying insects, especially bees and wasps, which are caught in the air by sallies from an open perch. While they pursue any type of flying insect, honey bees predominate in their diet. Hymenoptera (ants, bees and wasps) comprise from 20% to 96% of all insects eaten, with honey bees comprising approximately one-third of the Hymenoptera. Among the Hymenoptera taken, the giant honeybee is a particularly commonly eaten species. These bees attempt to congregate in a mass defence against these birds. Before eating its meal, a bee-eater removes the stinger by repeatedly hitting and rubbing the insect on a hard surface. During this process, pressure is applied to the insect thereby extracting most of the venom. Notably, the birds only catch prey that are on the wing and ignore flying insects once they land. Bee-eaters are gregarious. They form colonies by nesting in burrows tunnelled into the side of sandy banks, such as those that have collapsed on the edges of rivers. Their eggs are white and they generally produce 2–9 eggs per clutch (depending on species). As they live in colonies, large numbers of these holes are often seen together, white streaks from their accumulated droppings accentuating the entrances to the nests. Most of the species in the family are monogamous, and both parents care for the young, sometimes with the assistance of other birds in the colony, a behaviour considered unusual for birds.